Recently, scads of friends ask me how to convert VOB to MP4 format with a solid yet free video converter such that VOB files can be played back on handheld devices with nary a penny. To do such a favor for my friends, I have a brainstorming and discover the best open-source video converter for Mac, Windows and Linux so that any of my friends can use it on their computer regardless of the operating platform. It's well-known as Handbrake and I must admit it's quite impressive, trust me. You see, Handbrake 1.0.0 can convert any unencrypted DVD or BluRay sources to MP4, M4V, MKV, MP3, AAC and more file formats with fast speed and merely several clicks. So Handbrake converting VOB (the container format in DVD-Video media) to MP4 is just like taking candy from a baby. Before the specific guide on how to convert VOB to MP4 on Mac with Handbrake, make sure to download Handbrake 1.0.0 on your computer and launch it. For Mac users, please note the latest Handbrake version is compatible with Mac OS X 10.10, including the latest macOS Mojave, so if you've upgraded to macOS 10.14, please proceed to a Handbrake alternative for Mojave. Step 1: After download Handbrake for Mac, Windows, Linux, open Handbrake. Step 2: Click "Source" button to add the VOB file you'd like to convert to MP4. Step 3: On "Destination" portion of the Handbrake program window, select the output path where you want to save your new MP4 file by clicking the "Browse" button. 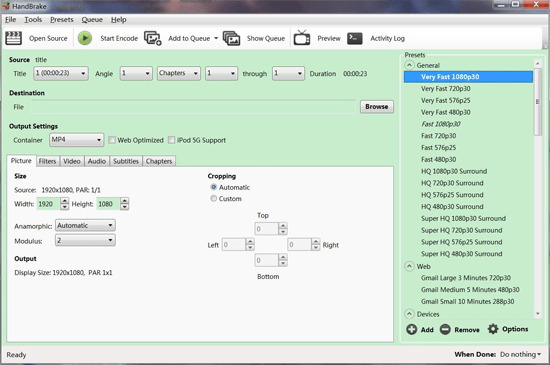 Step 4: Move your mouse to the "Output Settings" field, and choose MP4 file as the output video encoder from the "Encoder". Step 5: Now simply click "Start" button at the very top of the main Handbrake window to convert VOB video file to MP4 format. You can also use Handbrake to rotate video 90/180/270 degrees if the video is in the wrong angle. Handbrake has been caught in trouble recently that the latest 1.0.7 dmg (downloaded before 10:30 a.m. EDT on May 2, 2017) was compromised by an unknown malicious file including the Trojan. If you download and install it to convert VOB to MP4, an attacker could gain complete remote access to your computer, viewing the screen in real time, recording keystrokes, uploading your files, downloading additional malware, accessing the webcam, and issuing shell commands, among other nefarious activities etc. To get round all this this, why not move to another safe and reliable video converter for Mac and Windows? Handbrake 1.0.0 Convert VOB to MP4: Roses all the Way? Generally speaking, the conversion from VOB to MP4 can be quite an easy task with Handbrake 1.0.0. But sometimes it will be a little tricky to apply Handbrake to convert VOB to MP4 format as you highly possible encounter the common Handbrake No Valid Source Found error, audio/video out of sync problem, or Handbrake No Title Found issue in Handbrake. To tell you the truth, all these Handbrake issues are tough to solve. In such case, resorting to Handbrake reliable alternative is a sound choice. Here comes a finer Handbrake Alternative-MacX Video Converter Pro, which can not only ultrafast convert VOB to MP4 on Mac (Mojave) without any error, but also seamlessly convert other SD and HD video to MOV, AVI, FLV, WMV, MKV, etc. for playback on any iPhone iPad Android with 98% quality reserved. If you seek for Handbrake alternative for Windows, please head over to VOB to MP4 video converter for Windows version. 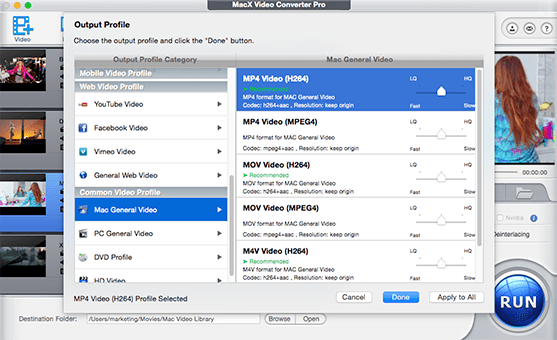 Download MacX Video Converter Pro, and launch the VOB video converter for Mac, click "Add File" button and locate the VOB file. Select MP4 as output format from the format list to convert VOB to MP4. Certainly, as the best Handbrake alternative, this awesome VOB video converter also supports you to convert VOB or other videos to iPhone 5S/5C/6/6s/7/8/X/XS/XR, iPad Air, iPad Mini with Retina, Samsung Galaxy S9, HTC One M10, Surface Pro 4 and more. Also learn how to convert M4V to MP4 with Handbrake. Click the "Browse" button to select a folder where you want to place your converted MP4 files. Press the "RUN" button to start VOB to MP4 conversion using Handbrake alternative. Tips: as the fascinating Handbrake alternative, MacX Video Converter Pro also plays the role as the coolest YouTube downloader and converter, photo slideshow maker and on-screen recorder and more. After you have a shot on it, you will be amazed at its versatile solution.